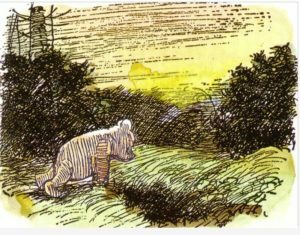 In one of Winnie-the-Pooh’s escapades (in The House at Pooh Corner), a pit is dug to set a trap for a Heffalump and baited with Pooh’s honey. Pooh becomes anxious about his honey, falls into the pit and then gets his head stuck in the honey pot. Setting a trap for Jesus must have been about as ridiculous, because inevitably the tables were turned and the trappers fell into their own trap. In this case, asking Jesus about taxation to try to get him to compromise himself with either the authorities or the oppressed Jewish taxpayers backfired when Jesus asked for a coin – which should not have been in the possession of a devout Jew, since it carried a depiction of the Emperor, who was described as “the divine Caesar.” That, of course, violated the second commandment about not carrying idolatrous images. Jesus’ answer was more than just a clever response to turn the tables. It posed the largely rhetorical question about what is God’s, what is the Emperor’s, and how one can decide which is which. Jesus suggested that the image of the Emperor on the coin gave the Emperor ownership of it. If that is the case, then if humanity is “created in the image of God,” we have to conclude that we bear God’s image within us, and therefore belong to God – all of us. This has directed Christian life ever since the early days of the Church. We are called to try to show love to one another and thus demonstrate to the world around what it means to be a follower of Christ by trying to bear his image in our lives. In the context of Jesus’ statement, this goes further: if all humanity belongs to God, then in fact, so does Emperor (and his modern-day equivalents, which more often than not are some sort of secular organisation, political or corporate). It means that, one way or another, everything belongs to God, to whom we owe allegiance before anything or anyone else. How can we demonstrate our primary allegiance to God? Perhaps a good starting point is to begin to answer three questions implicit in the prophecy of Micah and underpinning the ministry of Jesus. What does it mean to ‘do justice?’ What does it mean to ‘love kindness?’ What does it mean to ‘walk humbly with our God?’ God knows only too well that we struggle to answer these questions, and to live our answers faithfully. But in this case, we do get points for trying, to use a colloquial expression: we may not achieve perfection, but our efforts to be faithful make a difference. If we remember that we and those around us are stamped with the image of God, our lives and our relationships can be shaped accordingly – without setting traps into which we will most likely fall ourselves.